DIY Garden Irrigation System Guide. Time to Wat-o-Mate! Any avid gardener knows how useful it would be to have a yard full of crops that take as little maintenance as possible. The more self-functioning your system, the more time you have spare, to get on with that important task of relaxation. The whole point is to enjoy the bounty of your fruits, vegetables, and herbs. Find time to rest among the tranquillity of the beautiful colors and scents of your blooming flowers with a DIY Garden Irrigation System. “No garden takes little maintenance!” I hear you say. And, of course, you would be right. Every garden needs some labor-intensive input from us. Digging over the soil, to prepare it for planting. Removing weeds that want to choke the life out of your plants. Even the harvesting of your fruits and vegetables needs physical effort. But, there are things you can do to ease such burdens, such as creating an automatic irrigation system. It’s no scientific breakthrough to have self-watering crops. If anything, many of these designs have their roots in tried and tested age-old methods. So let’s find out how to turn that back-breaking manual job of daily watering into a smooth-running self-functioning task, and focus your time on more productive gardening activities. Self-irrigation is an ideal way to make sure that your crops don’t dry up in the heat of the midday sun. No more waiting for the sun to go down so you can spend hours going around your plants with a watering can. Carrying around that heavy load that needs constant refilling. No more wasting water with a constant flowing sprinkling system. No more dragging out the heavy hose pipe that blocks up every time you turn around. There are many low-cost ways to create an efficient self-working irrigation system that will do all the work for you. By setting up an irrigation structure, the water will go where it needs to be: directly at the plant roots. Plant leaves, by nature, should take their liquid sustenance from the roots. Watering crops with a watering can or hose pipe from the top often means that the roots don’t get watered. Plus, on a hot day, much of that water evaporates before it even manages to get to the ground. Let’s face it, a healthy root means a healthy crop. Hydroponic gardening is a good example of how an irrigation system works. Such self-made systems can also be set up for outdoor planting too. Another advantage of setting up an irrigation system is that you will save on water. If you normally water your garden manually, studies show that you will save a whopping 70% on water. That’s because the water is directed right at the point where it is needed the most, the plant roots. It is not difficult to set up your own irrigation system. This first self-made method is for any sized area that needs irrigation. These self-functioning systems can be even be set up in pots. If you are growing many crops, or just a few, then you could benefit from a Drip Irrigation System, whether you choose to start with a pre-selected kit or assemble your own system. If set up correctly, these systems allow a slow drip of water close to the roots of your plants. This type of irrigation system is ideal for a large area of plants, raised beds with flowers, or even over a few plant pots. 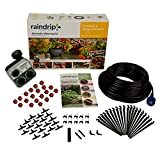 For those just starting out on their DIY Irrigation System journey, your best bet is likely to pick up a pre-selected Garden Irrigation System Kit, such as the Raindrip kit shown below. These packages usually have everything you need to get started and to get comfortable with these homemade watering systems. Once you’ve got the hang of it, you may find it more effective to pick up additional components as needed to expand your system. We’ve reviewed several pre-assembled Garden Irrigation Systems here. The Raindrip shown below is an excellent place to start. You could pay a landscape gardener a lot of your hard-earned dollars to install an irrigation system into your backyard, but where’s the fun in that? Take on the challenge and save your bucks. With or without DIY skills, you could take a few hours and build it yourself at only a fraction of the cost. The basics are to run some piping, could even be an old hosepipe. 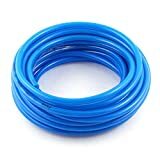 The idea is to puncture it with holes to allow drips of water to escape, similar to hoses like the Gilmour Soaker Hose. This can be done on a garden hose timer, or you can turn the water on and off yourself, manually. Be sure to consider a Wifi Water Timer for even more high tech simplicity. 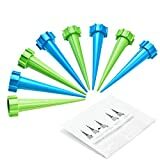 Rubber or silicone plastic piping is perfect for this Drip System. It should be around 4mm in width, wide enough to run water through. If it’s a larger area you need to cover, then connect several pipes together by using sealed connectors. Be careful though, not to make the system too large as the water pressure may suffer. If you prefer rigid plastic piping, then you will also need non-drip connectors to seal the pipework together, as one system. Connect the pipe to a threaded faucet, as you would connect a washing machine. This way your system has its own permanent connection, so you only need to set it up once. If you have no outside water connection, then it will mean drilling a hole in the wall so you can connect it to the main water system. If you already have water pipework outdoors, then you’re good to go. 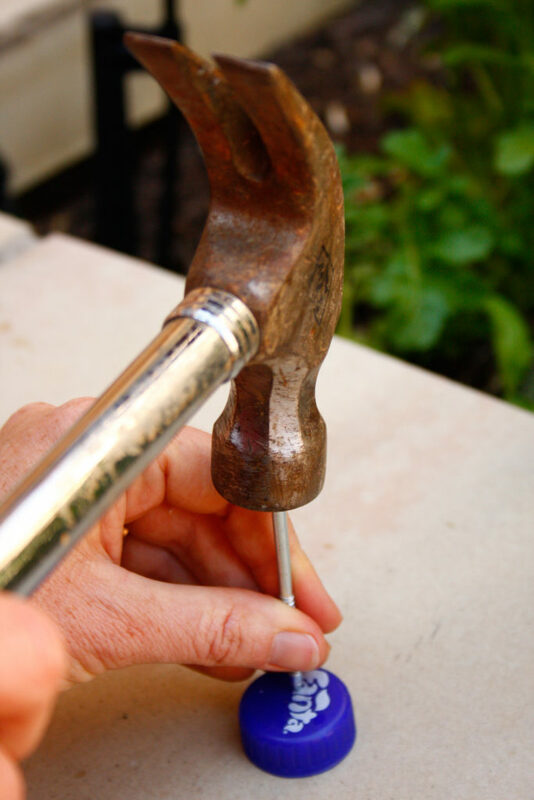 Connect the pipework onto an outside tap with a standard hosepipe connector. This method allows you to turn the system on and off manually, as and when you need to irrigate your plants. An even simpler method is to run your pipe from a tank or bucket of water. One advantage of this system is that you can use grey water collected from your rain barrel to irrigate your crops. You will need a pump with this type of setup, unless you are using a gravity fed system whereby the tank is raised. If you fit a pump in the tank then you can set a timer to switch on and for the water flow. This method would need an electricity supply close to the tank, so do take extra precautions. Alternatively, you could use a solar powered pump to deliver the water to your plants. The Blumat Kit shown here is a pre-assembled system using this watering method. It’s a good idea insert elbow connectors to allow for any bends. This way it avoids the pipe getting damaged or blocked. If you want a create a “circular flow” to your piping, insert a t-section into the pipe, about a foot away from the connection to the water supply. This means cutting the pipe and inserting a crimped T-connector, so it has a watertight grip on the piping attached. Re-attach the piping network at each end of the T-piece, so the piping now forms a circular network. The pipe is now fed from both ends, ensuring good water pressure throughout. You do not have to create a ring-style system. You could just lay out the piping in the same manner, but place a block manifold at the end of the system. The water pressure will stay in the pipe, and you won’t lose water out of the end. Decide if you simply want to punch small holes into the pipe, allowing the water to drip through your holes when it’s running. Or, add manifolds and drippers for a more effective system. When making the holes, measure them out according to where the plants are located. The dripped water needs to target the plant roots, so mark out your holes with a pen on the piping, so you get it just right. This next system is worth mentioning, as again you can do it for yourself and it is much simpler even than a drip irrigation kit. It works better in smaller areas or even fixed up in individual pots. All you need is a supply of plastic bottles (soda bottles, water bottles, etc.) and a hammer and nail. The principle is the same as the ring hose method: use a slow drip of water to keep plant roots moist. Top up the bottles with water as and when your plant needs it. Leave empty if they don’t need water. Surface irrigation is super simple and about as DIY as you can get. Gardenandhome.co.za has a great guide to doing this, but here are the basics. Take any plastic bottle, but 2-liter size works well. Puncture a hole into the lid, the smaller the hole then the slower the drip of water. Or, fit an irrigation spike into the opening of the bottle, instead of the lid. Fill the bottle with water and replace the punctured lid, or the irrigation spike, on the top of the bottle. Screw it tight to seal the bottle. Turn the bottle upside down. Bury the neck of the bottle, including the lid or irrigation spike, close to the plant you wish to irrigate. When you can see that the bottle is empty, simply take it back out of the ground and repeat. Alternatively, you can cut the bottle in half and follow the same method. The only difference is that if it is cut, there is now an opening in the bottle. You can keep topping this up with water without having to remove the bottle from the earth. It can remain in position without risking the constant tugging of it in and out of the hole at the side of your plant. The only negative side to this method is that you will lose water to evaporation, so will need to top up more often. Again with this system, you will need plastic bottles of around 2 liters in size. Take a thin nail and puncture plenty of holes into the body of the bottle. Bury the bottle in the ground, in a standing position, with the neck of the bottle at the top. Keep it close to the plant you are irrigating. Fill the bottle with water. It’s better to replace the lid when full, so you don’t lose water through evaporation, but it still works without a lid. You can top up the bottle without taking it out of the ground. 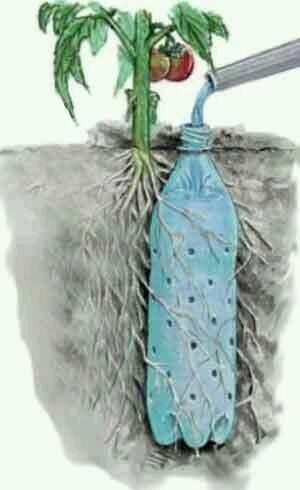 The roots may even grow around the bottle if you have managed to bury it close enough to the base of the plant. The plant roots have a constant supply of water, as long as the bottle is topped up. This is a method whereby you can recycle your plastic bottles, but you will need one for each plant, so it can take a while to set up. However, once you’re set up, you’re good to go. And another nice aspect to this setup is that you don’t really see much of the bottle. This is another method that can make use of recycled plastic bottles, but you will need one for each plant, so it can take a while to set up. Fill a bottle with water, you will need one for each plant. Make long wick with a piece of flannelling, or a long piece of thick string. Any material that will soak up water and retain it for a while. The principle is that the wick will soak up the water from the bottle, and transfer it to your plant’s soil. Put the wick into the top hole of the bottle, making sure it hangs right down to the bottom of the bottle, on the inside. Bury the other end of the wick into a small hole in the soil, as close to the base of the plant as you can get. You could run more than one wick from your bottle, depending on how greedy your plants are. Or you could simply set up one system up for each plant. This is self-regulating and does not overwater. If done correctly, it will stop your plants from drying out while you are away. For peace of mind, it is worth considering setting up a DIY Garden Irrigation system for self-watering, especially if you are going on vacation. Plants can be expensive, and a lot of work goes into getting them to flower and produce fruit. You don’t want to risk your plants while you’re away on a break. After time spent away from home, it will be lovely to return to healthy plants that continued to grow while you were away! None of these systems are difficult, so spend a little time deciding which irrigation system is the best one for you, and get it up and running before you go. If you need help picking out which tools to use, look towards sites like https://www.toolnerds.com/drills/magnetic/ and get the tips you need. Making it one of those “good for the planet” jobs to do.